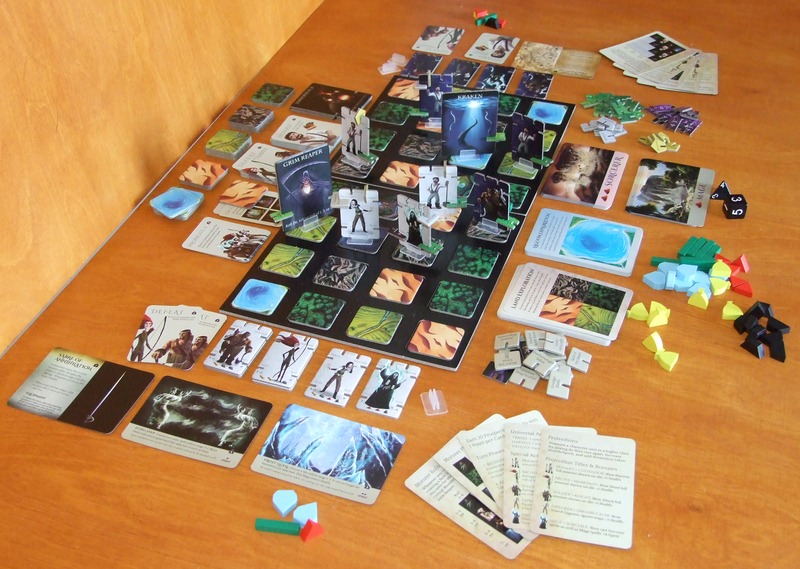 It is the first time when I have an opportunity to write a review of expansion for a game that I have not played yet, although this expansion can be played by itself as a standalone game. This time I’m inviting you to read my review of Stratos: Light in the Darkness – strategy game from Canada. This title hit the market at the beginning of 2017 just a year after the base game, published by Board & Tale. The authors are Jacob Chodoriwsky and David Gundrum and the artist responsible for how the game looks is Garth Laidlaw. Both Expansion and Base game are available at its website. In rather small, slick box we will find a pile of wooden resource tokens, two dice (six and four sided), twelve plastic character and monster stands. Next are 2 game boards made of thick durable cardboard, 2 sets of characters, 5 monster tokens, terrain tiles and piles of markers for items, character and monster stats. Last but not least, there are deck of cards with victory points, deck for exploration and deck of spells. You won’t find any insert in the box, but there are plenty ziplock bags for components and tuckbox for cards. The quality of components is beyond a shadow of doubt. 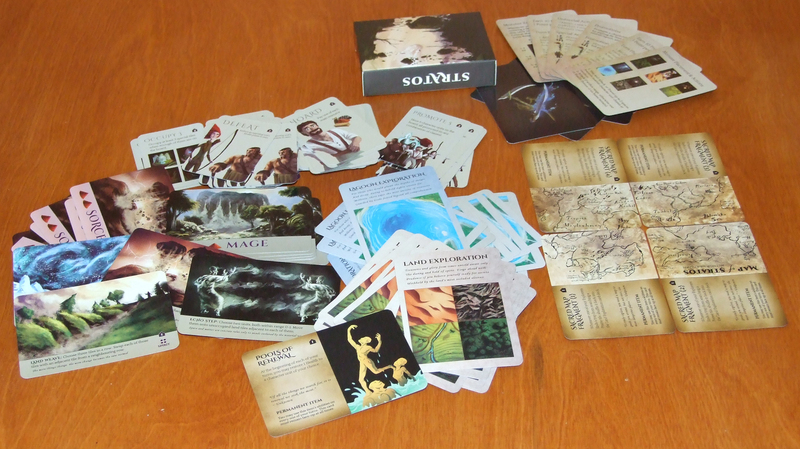 Cardboard is thick, cards are stiff and all is lightly coated. Graphics are captivating from the first glance, for many people with whom I had played they resemble the vibe of Dixit graphic style. Nearly all illustrations looks like they are mini versions of some beautiful paintings that, if available, I would love to put on my wall. 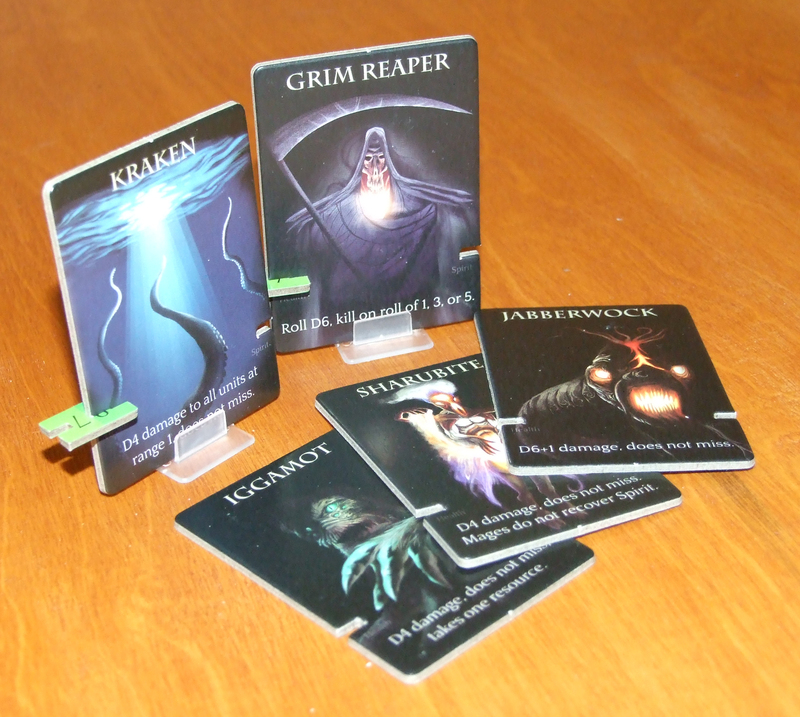 The idea of placing stat and item tokens into character and monster markers steals me also. In time I’m sure that these cuts will loosen a bit, and from time to time token will slide off, but as for now, after dozen or so plays with different people, everything stays in place. I think that this “sliding off” problem could be avoided if cuts were made at a different angle, so the sliding would push the token toward the center of character marker. In this game you are playing as a small tribe that had arrived to a newly discovered world. Your purpose is to be the fastest one to get 10 prosperity points which are Stratos victory points. To our tribal struggle you can put up to 5 units, where it is up to you who will be in your roster, having two character markers for each class available. Each unit, beside the standard set of actions, can do something unique available only for her class. So you can claim your prosperity via land exploitation, exploration or simple fight. Where you will need to use strength of your fighters, accuracy of your archers or put in field your mages and sorcerers, who will wield powerful spells. 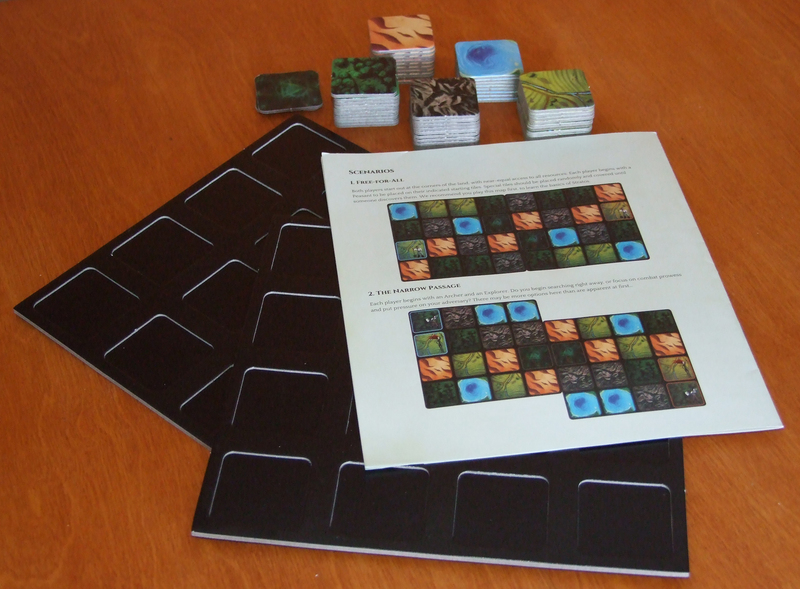 Our battlefield will be based on two modular boards filled with terrain tiles according to the scenario we want to play. Possibility of different board placement and different terrain tile placement gives this game loads of replayability. The authors also support and encourage players to try and create new game modes and scenarios. All is shared on growing Stratos community group on facebook and game website. Player in his turn will have opportunity to activate each of his units, doing two unrepeatable actions – only move action can be done twice. After activation, player can go to the part of his turn where he can advance his units, buy new ones, buy spells or prosperity points. It doesn’t take too much time to take your entire turn, and because it is a strategy game where you are compelled to watch and analyze what your opponent is doing, there is little to no noticeable downtime. One scenario can take an hour and a half of play time. As a strategy game Stratos has got some heavy randomness in it, which made me a little skeptical. 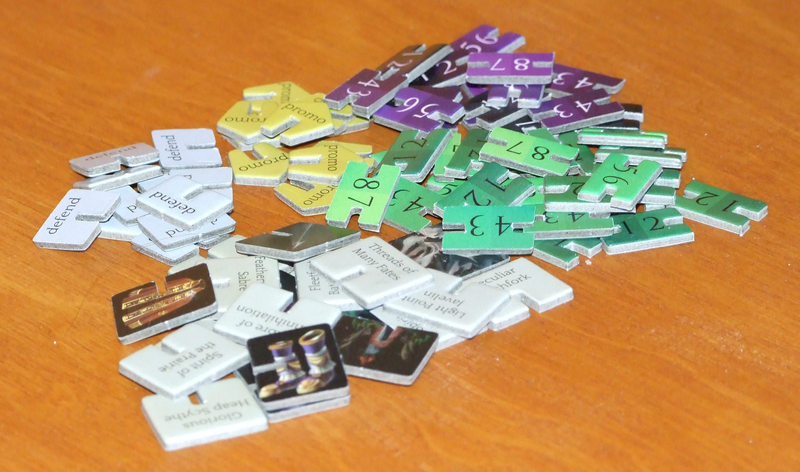 Random dice results, random content of explored terrain tiles, random spell and exploration cards seemed a bit much… nevertheless everything works fine. Push your luck mechanic is balanced by simple statistic behind the game, the player who is avoiding randomness only needs to counter that lucky beggar and steadily draw out game time, to get his opportunity to win. In my opinion this is one of most effective strategies here – to analyze, counter and force your opponent out of his strategy. That will bring you a balanced and involving duel. Of course the game does not forbid you to both have a half an hour, heavily luck based point chase. Or a 3 hour turtle marathon, where none of you will take a risk of failure on a dice roll. Much depends on the players approach to it. On top of all, if you would like to have some more variety, you can add to your play an unknown and uncontrollable factor called monsters. After a few turns up to two random monsters can appear on your battlefield, which will hunt everyone and everything without exception. Clever player will try to outmaneuver them into his opponent units, or to steal points for killing them from another player. After two weeks of playing Stratos: Light in the Darkness with many different players I can tell that this game is capable to take place in collection of really wide spectrum of board gamers. It can easily satisfy casual Sunday player as well as an oldtimer, rules can be explained with examples in less than 15 minutes and it doesn’t put players in a position where they constantly need to check something in faq or rulebook. One exception in my opinion will be the frustrated with luck gamers, forcing themselves into unprofitable statistic, blaming luck of other player for their loss and not that they didn’t try to change something in their strategy.